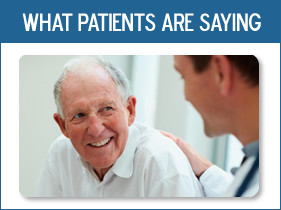 With a practice that’s over 25 years old, our physicians have seen a vast spectrum of patients and situations. Our staff is dedicated to excellence on a daily basis, and that means providing the best care for you from beginning to end. Our mission is to passionately pursue the health and well-being of our patients by providing quality care in a safe, effective and efficient manner through our culture of exceptional service. Our patients know that when you visit GI Associates, your needs and care are our top priority, and we’re dedicated to serving you. Our physicians have undergone significant amounts of advanced training in the gastroenterological field, working on varied cases, from the simple to the complex, on a daily basis. For complex and out-of-the-ordinary cases, we are the experts in the Chicago Southwest Suburbs that other primary care and specialists rely on. What does that mean for you? It means that you can rest easy, knowing that you are being treated by the best. Be comforted by the fact that we have the knowledge and expertise to treat your pain or disorder. Patients trust GI Associates because they know that our training and expertise mean higher quality care, more accurate diagnoses, and personal attention to your case. 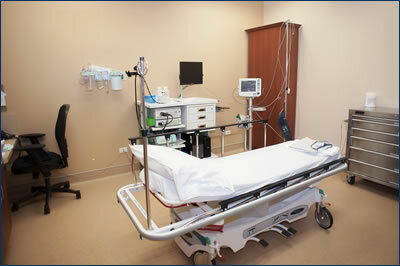 Our state of the art facilities in the Oak Lawn office offer a myriad of benefits for our patients. In 2012, we tore down our building down right to the foundations, rebuilt our office and furnished it with cutting edge medical equipment. Our equipment uses the latest technologies (including HD technology) for procedures and diagnoses, allowing our physicians to see more detail than ever before. This means we can see disorders or conditions in their early stages, and can treat them before they get to be truly painful. Having this technology also allows us to do most procedures onsite, instead of at a hospital. Sedation at GI Associates Endoscopy is provided by certified registered nurse anesthesists. This ensures the highest quality care and best sedation experience available. This ensures reduced time in recovery and less drowsiness after the procedure. We are proud to have partnered with Aegis Ambulatory Anesthesia to provide sedation services at our facility. They have vast experience in providing safe and comfortable care in the ambulatory facilities such as ours. 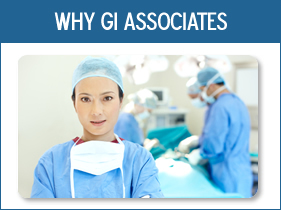 One of the advantages of using GI Associates is that we provide complete care in one location. Most specialists offer an office location for the diagnosis, and another for the procedure (usually a hospital). Visiting the hospital can be complicated and confusing, resulting in longer wait times and more paperwork. With GI Associates, we keep things simple. Over 90% of our procedures take place right in our offices. Our support staff has over 50 years of combined healthcare experience, including emergency room experience, so we are trained and experienced in handling procedures and any complications that may arise. The overwhelming majority of our cases go very smoothly, with less down time than a hospital, and a streamlined experience to keep you comfortable every step of the way. Our support staff has over 50 years of combined experience in gastrointestinal diseases and Hepatology. Our medical assistants bring both hospital and office experience, the best of both worlds. Our staff also has experience in critical care, and is well equipped to handle even the most complex cases. Our team is dedicated to your care and your comfort, to make sure that every visit goes as smoothly as possible. Our physicians give back to the community in several ways. Dr. Silva, Dr D’Astice and Dr. Raddawi teach medical students and residents at Advocate Christ Hospital, and Dr. D’Astice serves as the section chief of Gastroenterology on the Executive Committee at Little Company of Mary Hospital. Dr. Raddawi is also an Associate Clinical Professor at University of Illinois, and is the Head of Medical Education at Midwestern University. Dr. Silva is Assistant Clinical Professor at University of Illinois and serves on the Clinical Competency Committee at Advocate Christ Medical Center. Dr. Sunbulli serves as the Head of the local chapter of the Muslim-American Physicians Association, and frequently does charity work. If you’re looking for personalized care and experienced professionals, with GI Associates you’re in good hands. Contact us today for more information, or to schedule an appointment.